Co-founders Anna Meloto-Wilk, Dylan Wilk, and Camille Meloto shared about the brand’s very humble start. Did you know that it all started in Anna and Dylan’s home? They kept stocks on the second floor of the house, and entertained potential buyers in their living room. Whenever they closed a sale, they had to run up and down the stairs! I had to admire their guts, since all of them were at points in their lives when starting a business is not exactly ideal. At the time, Anna and Dylan had two small kids to care for, and Camille had just graduated from college. They were fueled by a common dream: to build an enterprise that enabled Filipinos to produce world-class natural products, and in the process build a new middle class to take people out of living in poverty. Human Nature now employs almost 600 people, and has about 50,000 active dealers. In keeping with their mission and vision, it is part of the company’s targets to improve the lives of everyone involved with their network. It’s not a vague goal either - their business operations are crafted with their employees in mind. I’m a fan of Human Nature’s unique work culture. I’ve never seen employment policies like theirs before, which heavily favor employees as opposed to employers. They believe that given the right opportunity, any Filipino can rise out of poverty, so high school and college diplomas are not required for applicants. They also have a “No Firing Policy” which means that the only people who’ve left the company are those who resigned. Instead, their people have receive regular training and opportunities for growth so that even initial poor performers can become successful. Human Nature takes equal-opportunity employment even further with added benefits that improve quality of life, such as financial assistance for education, weddings, and even newborns! Sundays are required rest days for all, including at first mall-based flagship store in SM North. Plus, they have always paid above the minimum wage right from the start, when they decided on a P500 base daily wage instead of the recommended minimum wage of P382 at the time. Even more admirable is their commitment to their partner farmers and communities. Farmers are assured of consistent demand for higher-value crops. Buying prices are well above market prices, encouraging agricultural growth. They also invest in partner communities via infrastructure, equipment, training, and values formation. They’ve also managed to translate the spirit of bayanihan to local businesses by partnering with social enterprises. They currently have over ten social enterprise partners like Bayani Brew, Sweet & Fit Stevia, HOPE water, and First Harvest. Partnering with Human Nature boosted these brands’ successes, enabling them to increase their sales channels into partner stores and supermarkets. And their journey doesn’t stop there! 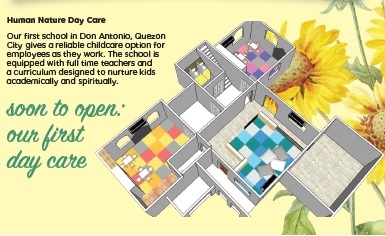 Plans are currently underway for the first ever Human Nature Day Care in Don Antonio, Quezon City. This school will be open to kids of Human Nature employees, so workers can be eased of their worries and better focus on their work. Supporters of the Zero Waste Movement will also be happy to hear that Human Nature plans on opening refilling stations, a consistent request by environmentally-conscious customers. They’re still ironing out all the details but exciting times are ahead for both employees and patrons! I confess to being a fan of the brand even before attending their eye-opening 10th anniversary. I first saw Anna Meloto-Wilk speak about Human Nature at an ANC show, and her passion and ambition made a strong impact on me. It was clear that she is determined to use this platform to improve the Philippines, Filipinos, and the environment. I wanted to sign up as a distributor, but was discouraged as I had to submit the application form to a Human Nature branch, of which there were none nearby. So I contented myself with buying online, and later at their partner supermarkets. I feel honored to have witnessed a celebration of love for the Philippines with Human Nature’s 10th anniversary. I’m excited to somehow be part of their story, no matter how small my role may be. For me, every purchase from the brand is a win for our country. Have you tried Human Nature products? Which ones are your favorites? Human Nature products are available nationwide at Rustan’s Supermarket, Robinsons Supermarket and Department Store, Shopwise, The Landmark, Watsons, Metro Supermarket, Walter Mart, and Fisher Supermarket. Stores like Beauty Bar and Sesou also stock some of their products. They have extended their digital reach as well, with online stores at humanheartnature.com, as well as Zalora and BeautyMNL.